Stitch these reversible afghans with a regular crochet hook! 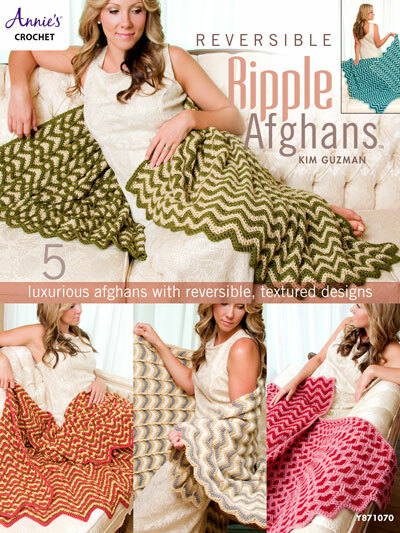 You can create these five lovely afghans that maintain the look of the ever-loved traditional ripple on one side, while updating it on the other by creating interesting patterns, shapes and textures. The unique nature of these fully reversible throws will quickly become a favorite in your home decor and gift-giving. Made using a soft worsted weight yarn. Finished sizes: 46" x 53", 54" x 56", 48" x 62", 44" x 52" & 52 1/2" x 56 3/4". Love the ripple heart afghan! I am havin a hard time getting my hearts to be as defined as they are in some pictures, mine are more triangular. Any suggestions? Chelsi - We would like to find out more from you concerning your post. Someone from pattern services will be contacting you shortly to see what we can do to help. Help I'm really struggling with row 5. I wish I had read the reviews before I bought the book. I'm not the only one struggling here. I just can't get the numbers to add up. Any advice? Leyla - you can find a video for the stitch in our online Stitch Guide. Here's a link to it https://www.anniescatalog.com/crochet/content.html?content_id=809&type_id=S&scat_id=332. I am starting the sweetheart ripple and I was wondering if you could explain the ftrp. Marisa - We would like to find out more from you concerning your post. Someone from pattern services will be contacting you shortly to see what we can do to help. I too am having trouble with row 5! Help! Michele - You can find help with the special stitch from the designer at this link http://www.crochetville.com/community/topic/93270-sweetheart-ripple-afghan-cal/. I have the pattern book that I purchased in the past. I had wonderful success with the Brocade and Vanilla Cream. 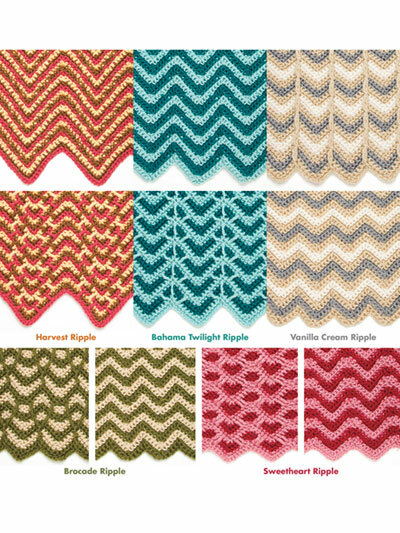 Am completely stuck and confused on the Bahama Twilight with the fptr-sc stitch and the rows afterward. Nothing is lining up and the stitch count is not right. Any video help for this one? I have been crocheting for close to 46 years and have never had this trouble. Thank you for any help you can provide. Shannon - We would like to find out more from you concerning your post. Someone from pattern services will be contacting you shortly to see what we can do to help.